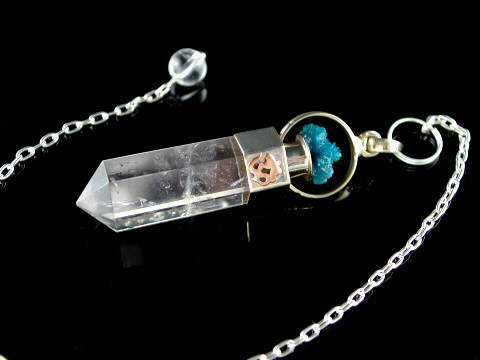 Beautifully designed Clear Quartz pendulum with a substantial 925 sterling silver collar, set with a Cavensite crystal. The sterling silver collar has two, small, copper 'OM' symbols; one on the front and one on the back; embuing this very unusual pendulum with the additional, very spiritual vibration of ths most special symbol. Absolutely exquisite! Clear Quartz is one of the most abundant crystals on the plant. There are two main forms; macroscopic (large, or 'massive' crystal - usually large pieces of Quartz without any obvious terminations) and microscopic; those with natural terminations. These pendulum points (we have three available) started life as natural, generator (six-sided), terminated crystals, which were subsequently polished to reveal their inner beauty before being set in sterling silver. They're finished with a 6mm, Clear Quartz topper bead. Cavensite is a lovely and still relatively rare crystal, with an exquiste vibration and superb deep turquoise colour. A very spiritual stone, Cavensite aligns with the Heart, Throat and Third Eye chakras and is a crystal for psychic development. It works especially well in relation to communicating intuitive (i.e. clairsentient or clairvoyant) experiences. It helps us to coherently express these intuative messages, whilst also developing and expanding existing psychic abilities or awakening latent ones. It has a beautiful and gentle, yet powerful energy. The 'OM' symbol hails from the Buddhist culture and belief system. It is one of pure, transcendant, spiritual energy and when included on a crystal piece - as with these pendulums - the item becomes embued with vibrations associated with this symbol. The sacred and ancient energy frequency of 'OM' aligns with both the Crown and Higher Crown Chakras. A secondary mineral from the Silicate class, Cavensite is usually found on Apophilite and Zeolite (especially Stilbite) group specimens. Only discovered in the late 1960s in Oregon, most commercial Cavensite available today comes from Poona in India. This pendulum has a beautiful combination of energies; the fast-acting 'male' energy of the Clear Quartz point, with the softer, feminine energies of Cavensite, plus the high spiritual vibrations of the ancient 'OM' symbol.